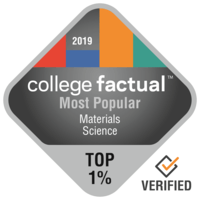 The Most Popular Materials Sciences Colleges in the U.S.
Materials Sciences is a major studied within the field of Physical Sciences. Materials Sciences is ranked 265th in popularity out of a total of 384 college majors analyzed by College Factual. It is an uncommon major with only 193 graduations per year. 31% of Materials Sciences students are women while men make up 69% of the student body. The Middle Atlantic region is home to the most common Materials Sciences colleges. Keep scrolling to explore the most popular colleges and universities for Materials Sciences majors. Here's how we came up with the ranking. Chances are, these schools are most popular for a reason. Check out what other categories these colleges are highly ranked in by clicking on their profiles. Pennsylvania State University - University Park is the top choice if you are interested in a degree in Materials Sciences. Located in University Park, Pennsylvania, this university is best suited for learners who flourish in a city atmosphere. Students from outside the U.S. don't have to worry about being out of place mainly because 11.6% of Penn State's undergraduates come from other countries. Freshmen are not required to live on-campus at Pennsylvania State University - Main Campus. Obtain all the vital specifics on Penn State by checking out their scorecard. Carnegie Mellon University is among your best bets if you want to study Materials Sciences. Based in Pittsburgh, Pennsylvania, this institution is a very good option for students who enjoy the thrill of a significant city. Concerned that you can't afford Carnegie Mellon University? Don’t allow that to stop you from submitting an application since 52.0% of students get financial help. Given that 40.8% of Carnegie Mellon's campus originates from outside the United States, you are going to have many chances to befriend undergraduates from all over the world. Ever wish you had a simple way to find out how a school is performing across all areas? Now you do. Have a look at Carnegie Mellon University's scorecard. It's hard to beat University of California - Berkeley if you want to pursue Materials Sciences as a major. The location in a major urban center is great for young people seeking ample possibilities for networking, adventure, and exploration. Around 78.0% of UC Berkeley applicants send their SAT scores, which average around 1,405. You might want to invest in an ACT prep course before taking the exam since the usual ACT score is 32. Learn more to see how well UC Berkeley ranks in other categories. University of Arizona is a wonderful choice for students pursuing a Materials Sciences degree. The setting in an important urban center is great for students seeking ample opportunities for networking, adventure, and exploration. Students should not let affordability concerns stop them from applying to this school since 68.0% of undergraduates receive financial aid. There is a graduate program available for those who are interested. Check out some school videos to learn more about what being on campus is like. University of California - Los Angeles is among your best bets if you're planning on studying Materials Sciences. University of California - Los Angeles is among the largest schools in California. Ranked #3 in California for overall value, we would have expected this university's excellent academic programs to command a greater price. For graduates who want to carry on after earning a bachelor's degree, University of California - Los Angeles has grad programs available. Look at all of University of California - Los Angeles' rankings to learn more. Every student pursuing a degree in Materials Sciences has to check out University of Wisconsin - Eau Claire. The setting in an important urban center is great for scholars trying to find adequate opportunities for social networking, adventure, and exploration. You might want to invest in an ACT preparation class before you take the exam because the typical ACT score is 24. With 78.4% of the professors being full time, students are sure to get plenty of interaction with educators. Interested in knowing more about University of Wisconsin - Eau Claire's campus? Have a virtual tour. Any student pursuing a degree in Materials Sciences needs to check out Columbia University in the City of New York. New York, New York is an ideal environment for individuals who enjoy the fast moving urban lifestyle. About 55.9% of the professors at this school are full-time and get normal office hours, so they should be more accessible to students. This school has a low crime rate, among the safest in the U.S.. Interested in knowing more about Columbia University in the City of New York's campus? Take a virtual tour. United States Air Force Academy is among your best bets if you're planning on studying Materials Sciences. Students who like a more relaxed life will appreciate the school's position in the tiny town of USAF Academy, Colorado. The more time it takes to complete their education the more loans students have to take on. This college features a superior freshman retention rate, with 94.0% of first-year students returning the next year. Go deeper and see just how well USAFA ranks in other categories. Northwestern University is one of the best schools in the United States for Materials Sciences. Northwestern University has one of the largest student bodies in Illinois. First-year students are not required to live on-campus at Northwestern University. For graduates who would like to go on after earning a four-year degree, Northwestern University has graduate programs available. Where is Northwestern U really succeeding? Take a look at all of the school rankings. Pennsylvania State University - Abington is one of the finest schools in the United States for Materials Sciences. Pennsylvania State University - Penn State Abington is located in the suburban region of Abington, Pennsylvania, near to shops and other amusement. You might want to invest in an ACT prep course prior to taking the exam because the typical ACT score is 24. With the diverse campus at Pennsylvania State University - Penn State Abington, you should have plenty of chances to meet students from all walks of life. Get an idea of what student life at Pennsylvania State University - Penn State Abington is really like by watching a few campus videos.